I was very pleased to bring forward this Motion regarding a downtown grid of adjustable bike lanes at the meeting of the Riel Community Committee on November 7, 2016. As the next step, this matter will be forwarded for further consideration to the November 29th meeting of the Standing Policy Committee on Infrastructure Renewal and Public Works (IRPW). My thanks to the Winnipeg Metro for reporting on this initiative. THEREFORE BE IT RESOLVED that the Standing Policy Committee on Infrastructure Renewal and Public Works request the Winnipeg Public Service to report back in 60 days with a proposed plan that would show necessary steps associated with the implementation of a downtown grid of adjustable bicycle lanes before the end of 2018; those steps should include a proposed public engagement plan, a proposed preliminary set of streets for consideration, and a proposed source of funding under the current budget forecast. Coun. Janice Lukes put rubber to the road on a fast-tracked downtown bike grid this week. After a well-attended forum proved there’s interest in speeding up the cycling network, Lukes drummed up a pitch for a “downtown grid of adjustable bicycle lanes before the end of 2018.” She presented it to the Riel community committee on Monday. The motion has been forwarded to the infrastructure renewal and public works (IRPW) committee for further consideration at its Nov. 29 meeting. She explained how rolling out protected cycling lanes with minimal, adjustable materials would be an affordable way of bolstering the city’s existing active transportation (AT) infrastructure in a timely, low-risk way that was already proven in Calgary and Edmonton. “Calgary’s was temporary too, they’re building it in more now that it’s been successful… Edmonton is the same story, they’re doing consultation while it’s in, even more condensed,” she said. 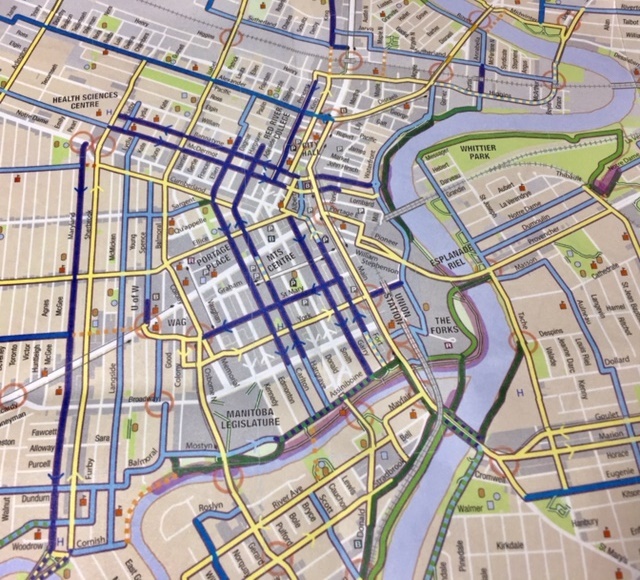 But because extensive consultation was already done in Winnipeg to identify routes during the development of the council-approved pedestrian and cycling action plan, Lukes is confident a lot of the work is already done. “We spent more than a year and a half studying cycling pedestrian strategies… we know what streets we want to put things on, years of study (are applicable) to this,” she said, noting this proposal would only fast-track “the arteries,” or bare-minimum for a complete network that could be built-up gradually in the coming years. Not to rush the process, Lukes wants city staff to update stakeholders, businesses and the community with a “rigorous” public engagement plan before going any further. Still, the idea is to expedite the process of bike-lane installation with pop-up infrastructure to prove the “build it and they will come” idea and transform downtown in the process, hence the 2018 deadline. On her side is a vocal bike community and its champion, advocacy group Bike Winnipeg, as well as a federal government moving into the second year of its mandate that may have AT funding to offer municipalities with a shovel-ready plan. Lukes wants this to be shovel-ready if federal funding opens up. “I’m only one vote, right,” she said. On her website, Lukes asked anyone who supports fast-tracking a gapless grid to register with the city clerk so they can speak at the Nov. 29 IRPW meeting in favour of the plan. She admits it’s ambitious and knows it already has critics, but she also doesn’t see why other cities should get praise for taking bold progressive action in AT infrastructure while hers takes years to install even one downtown bike lane. She wants Winnipeg to do better. “The wheels are in motion,” Lukes said.